Rei Kiriyama's status in the world of professional shogi continues to improve (he achieves a coveted newcomer's award), and he even finds a niche of acceptance in his high school. With his own self-esteem rising (he's even seen smiling from time to time), he seeks to give back support to those who've helped him, especially the Kawamoto Sisters- and the middle sister, Hina, in particular needs a friend right now. The first thing I'd note about Second Season is that Kyouko, who was such a dramatic powerhouse in the First Season, pretty much disappears early in this season. And thinking of Kyouko inevitably leads to thinking of the person she's paramour to, Gotou, and that leads to my main continuing grievance with the show, its peculiar sense of humor, and how that, in my opinion, often sabotages the show's drama. A "for instance"? Okay. At the beginning of this season we see Gotou actually defending a fellow player- so our chief "villain" (to the extent the show has one) is actually being given NUANCE, and that is a joyous thing; one-dimensional characters are really not very interesting. We get even more effort to make Gotou sympathetic when we are shown the circumstances related to his affair with Kyouko. I was 100% on board with the show up to here. But then...we see Kyouko and Gotou engaging in some banter apparently meant to be playful and funny. And then there are the rants. Now, a really good rant can be both fascinating and hilarious, and I've been in the presence of a few magnificent ones in my time, but the ones in March didn't move me. I finally realized why: March's rants are typically just exercises in free association, while the rants I find interesting are basically inductive logical arguments, in a way- though the supportive evidence drips with sarcasm, is delivered in a near-hysterical manner, and is aimed squarely at some despised target. A very good scripted example is in A Fish Called Wanda, where Jamie Lee Curtis' character explains why Kevin Kline's character is stupid, with plenty of illustrative examples. When something like this happens in real life, it can be rather amazing, but the closest March comes to it this season is when Akari and Hina blame Rei for their own overeating when he treats them at a restaurant to celebrate a shogi achievement. But yes, there IS much good in Season Two, and it well outweighs the bad. Second Season is really Hina Kawamoto's season. The dominant event, by far, is some bullying Hina is receiving because she stood up for another girl who was being bullied. Her teacher makes this even worse by inexplicably acting like it's all Hina's fault, and things spiral out of control to the point that the school administration must act. The resources that are required to uproot this sort of entrenched cruelty are shown as not that different from the ones needed to bust a criminal conspiracy, which I can imagine often WOULD be required- which is undoubtedly the reason why schools end up leaving students on their own in these situations, unless the damage, as here, spreads beyond the students. Yet Hina proves very resilient, even more than her big sister Akari. Second Season clarifies an important point about the sisters' family situation. But I WAS bothered that apparently- as much as I can judge by the context he says it in- this is the first time Rei has asked about this, and it's such a basic point that I found it incredible (in the literal sense of "not credible") that the sisters had never volunteered this information to Rei before, much LESS that he'd never ASKED before. In any case, Akari suddenly finds herself in over her head, despite her best efforts, and maybe human beings are more interesting dramatically when they fail than when they succeed; I certainly began to like Akari (who I'd previously found too aloof) quite a bit more afterward. The sisters do a fairly credible job of filling the void left by Kyouko's absence, and since they do this better than I would have ever expected, I'm OK here. But this is a show about shogi, so is any shogi happening? Oh, yes! We have some episodes devoted to individual players. One features the oldest old-timer of the Shogi Hall, Kishou Yanagihara, who knows he'll have to give up shogi someday- but not just YET, not so long as the will's still in him. There's also a player named Junkei, who feels like a failure, and wonders if even his best effort will really amount to anything. (You'll hear this exact sentiment from a different character this season as well.) Finally, there's a "legendary" shogi master, reputed to be the most skilled player of all, Meijin Souya, who Rei ends up playing we'll say a bit prematurely, in a commemorative match. I figured Souya had to have SOME issue, but it didn't turn out to be the one I expected. Recommended Audience: You know, I can't recall the Sisters ever being used for fanservice per se; the closest it ever comes to being "racy" is that Akari's job is in a hostess club. (ANOTHER reason to miss Kyouko, I suppose.) There's quite a bit of cruelty directed at poor Hina here, though, and the girl she was defending is so traumatized that she has to do rehab in a "special" school. We'll go PG-13 on this one. 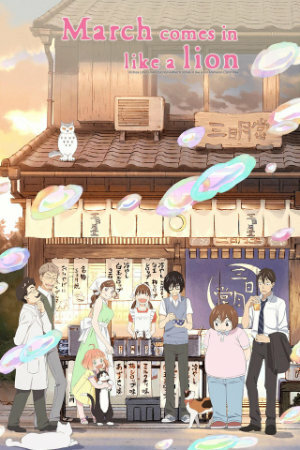 March Comes In Like A Lion season 2 © 2018 Shaft.